the jewkes: What'choo talkin' 'bout, Willis? I didn't know Layla was adopted. ha ha. Ok. First of all, her outfit is SO cute. I love love love it. 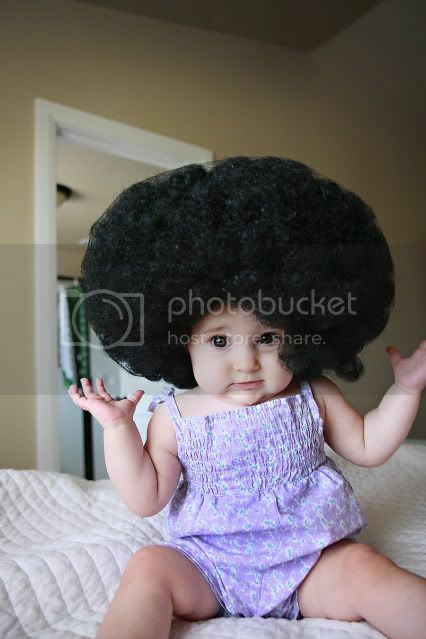 And second of all, I love her afro. Honestly, where the crap did you find that?!? lol She is so cute. Oh my word !!! That poor poor kid. :) ha ha ha .. I used to do stuff like that to my cats. next thing im sure you will be putting tin foil on her feet and hands. :) What a darling face .. did she laugh or cry while you two were haveing fun?